A trip to Dawn Mine makes an interesting adventure. I usually find more satisfaction in climbing to a summit than forging through a thick canyon forest to a waterfall or mine. But my trips to Dawn Mine have always been a treat. Millard Canyon offers a delightful experience. John Robinson puts it aptly: "Woodsy Millard Canyon ranks as one of the more pleasant retreats in the front range of the San Gabriels. Nestled deep between Sunset Ridge and Brown Mountain, the canyon seldom suffers the full glare of the sunlight. Beneath overarching oaks and sycamores, the small stream glides and dances over water-tempered boulders, finally to tumble headlong over Millard Falls." Unfortunately, the 2009 Station Fire, which consumed 160,577 acres, caused considerable damage in Millard Canyon, resulting in five years of closure. The area was reopened in summer 2004. The canyon is recovering but will take years to return to its former beauty. There are several possible variations of the hike to Dawn Mine. John Robinson describes an out-and-back, 5 miles round trip with 1,200 feet in elevation gain, taking the route up the canyon. John McKinney describes the same hike but puts it at only 800 feet in gain. Jerry Schad presents it as a loop, 6 miles round trip with 1,600 feet in elevation gain. His route follows the fire road and Sunset Ridge Trail up to Dawn Station, then descends to the mine, then follows the canyon out. The trip to Dawn Mine is well covered in hiking literature, both in print and on the Web, but hopeful I can contribute some helpful details. If you hike the canyon route to Dawn Mine, route finding can be tricky. The first mile into the canyon is on a nicely maintained trail. But as you begin your 1.5-mile venture up the canyon, the "trail" is non-existent or in poor condition in places. There are numerous creek crossings (you probably can avoid getting wet), boulder hopping, and some climbing over and under logs. The trail descriptions of Robinson (pre 9th Edition), Schad, and McKinney are a little vague in places and leave out some vital navigational cues (see below for details). Over its 50-plus years, Dawn Mine produced more stories than gold. Enough gold was recovered to keep various over-optimistic operators looking for the bonanza that never came. Some unknown prospectors discovered gold in Millard Canyon in 1895 and small claims were staked and worked for 7 years with marginal results. 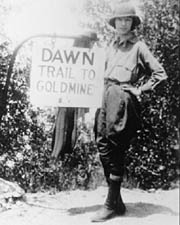 Minor Bradford Peck named the mine for Dawn Ehrenfeld, little daughter of a friend from the Randsburg Mines. Michael Ryan bought the Dawn Mine in 1902. He bore tunnels into the canyon's rock walls and was successful for several years. He built a narrow trail up the steep slope to the Mt. Lowe Railway. Two mules, Jack and Jill, carried the ore to Dawn Station to be transferred to railcars and taken down to the valley for milling. After Ryan's death in 1929, the mines set idle for several years. In 1933 Ryan's widow leased the holdings to Hunger, Comstock, and Hilton, who bored a new, 1,200-foot tunnel and built a small mill. They had good success at first, but in spite of considerable more digging, the gold petered out. In a few more years the venture was closed down. In the 1940s and early 1950s, other miners gave it a try but with no positive results. (Source: The San Gabriels by John W. Robinson, Big Santa Anita Historical Society, 1991, p. 52). Jake Brouwer reports that when the mine closed, a wooden door was placed across the opening, but it failed to keep out curious explorers. In 1954, Sheriff Pete Sutton inspected the mine and recommended that the openings either be dynamited closed or closed by steel doors set in concrete. Officials contacted the owner, C. H. Finlayson, but evidently nothing transpired. John Robinson, in Trails of the Angeles (pre 9th Edition) (Hike 19), indicates that the tunnel is boarded up. But in my visits from May 2001 to January 2006, nothing but the perilous hazards of mine exploration bars the intrepid explorer. This span avoids the hot summer months. You may also find it doable in the summer if you start early in the morning. 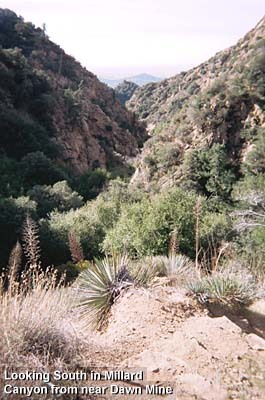 The canyon route features dense shade most of the trip. The Dawn Station route climbing out would be pretty grueling in the midday or afternoon sun. View Seasons of the San Gabriels for a detailed description of minding the seasons. From the I-210 Foothill Freeway in Pasadena, exit at Lake Avenue. Drive north (toward the mountains) for 3.5 miles to the end of Lake Avenue. Turn left (west) on Loma Alta Drive and drive 1.0 mile to Chaney Trail (marked by a blinking yellow light). Turn right and drive north on Chaney Trail. You'll pass through a gate that is locked from 8 p.m. to 6 a.m. After a winding 1.1 miles you reach Sunset Ridge. Turn right and park anywhere along the road, but don't block the gate. This is a popular trailhead, so there may be lots of cars. A National Forest Adventure Pass is required to park. Walk east on the paved fire road past the locked vehicle gate. In about 100 yards you reach a junction. An unmarked trail leads to the left (north) down to the Millard Campground. 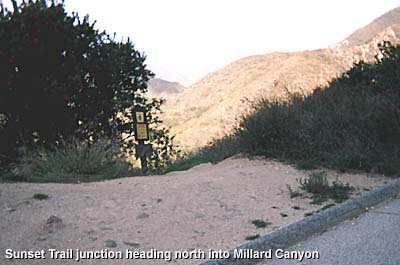 A sign next to that trial reads "Altadena Crest Trail," pointing both ways along the road (Be careful not to interpret the sign as referring to that trail heading north. The sign refers to the road which will connect with the trail latter on). Robinson (pre 9th Edition) does not mention this junction, so you might mistakenly take the trail on the left. 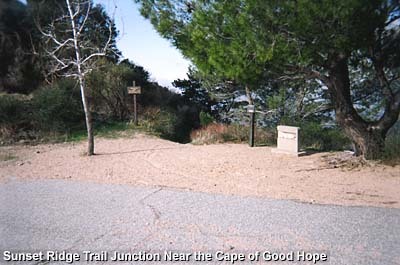 A sign-in box and a Mount Lowe historic informational sign are on the right. Continue up the paved road for another 300 yards to a trail on the left (Sunset Ridge Trail). Robinson (pre 9th Edition) describes it as an "unmarked trail," but there is now a sign (Sunset Ridge Trail. Sierra Saddle 1, Echo Mt. 2 1/2, Mt. Lowe Campground 4 1/2). Leave the road and follow the Sunset Ridge Trail, first north, then curving around east. You'll begin to hear the delightful music of Mallard Falls out of view below you. In a few minutes, after you round a bend, views of the Saucer Branch Falls emerge in the canyon below to the north. In a few more minutes the trail gently descends to a junction, at about 1 mile from the start. To the right is the signed Sunset Trail (12W18) (see optional route below, described by Schad). But to take the canyon route to the mine, veer left and immediately cross a ravine and pass a cabin on the right. You sharply descend and in about 3 minutes you arrive at the creek. 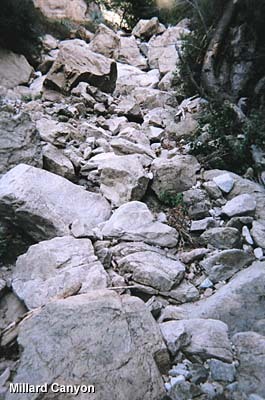 The trail disappears into a jumble of boulders. This is your route! Robinson nicely puts it: "As you scramble up-stream, you will meet stretches of the old trail here and there, but mostly you will boulderhop." McKinney has this caution: "As you begin hiking up-canyon, turn around and note the trail that brought you down to the canyon; it's easy to miss on your return trip." Dawn Mine - This abandoned mining equipment on the west bank of Millard Canyon marks the location of the mine. You can look into the tunnel but it is deemed unsafe to explore. The support timbers are rotting, the floor is covered with several inches of water, and there is a deep, water-filled vertical shaft about 40 feet in. Aside from your obstacle-ridden footpath, the canyon is delightful with its sparkling pools and rich woodsy charm. Generally, you will follow a section of trail for 20 to 80 yards, then cross the creek to find another section of trail. I counted 21 creek crossings. As you start your creek route, you will be heading east. After about 7 minutes the canyon branches and you see a tributary coming in from the north. This is Saucer Branch (about 100 yards up that route is the base of a series of majestic water falls, however, the primitive use path on the steep, lose slope is precarious in places and poison oak abounds. 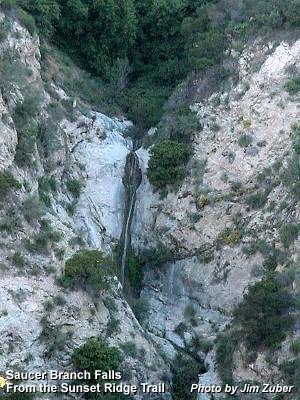 Read the Saucer Branch route description on my Millard Canyon Falls page). But you will veer right, continuing east. After a couple bends, the canyon turns sharply to the north. You'll scramble up the creek staying to the left as you round the bend. Just past a large rock face, notice the path subtly emerging on the left disappearing under a bay tree (next to a rusted pipe). This route climbs high on the west bank to avoid an imposing stretch of huge boulders. If you miss the trail you'll find yourself climbing over and through the granite maze until the massive rocks forbid you to climb any further. This may be the section where Robinson (pre 9th Edition) describes, "After slightly more than a mile, the canyon suddenly elbows north; just beyond you must climb steeply up the right (east) bank to circumvent a rocky obstruction." If it is, note that the trail goes up the left (west) bank not to the right as Robinson describes. However, I think his description here was intended to describe the section right as you get to the mine. In about 10 or 12 minutes past the boulders, while on the right bank (east), you may notice a faint path leading across the creek to a open area. If you want to explore it, you'll find a few remnants of what looks to have been a miner's encampment (this may be what Schad describes, "About 1/2 miles below the mine a wider area of the canyon, with a high and dry terrace [on the west bank], could be used as a wilderness campsite"). Continue up the trail on the east bank, and in an another minute you cross the creek to the left bank (west). You may notice a 3x2-foot water shaft coming out of the base of the rock face on the west bank. In another 5 creek crossings (10 or 12 minutes), you'll be on the east bank. Just before you pass under a suspended water pipe that crosses over the trail, there is a spur trail that cuts to the right (east) (This is probably what Robinson was referring to in my note above). I recommend ignoring it and continuing straight on the trail under the pipe (The side trail leads up to a junction on a spur ridge across from the mine). In another minute the trails disappears into the creek bed and you pass through a narrow section of canyon with steep walls on both sides. You may spot an old four-cylinder engine embedded in the stream rocks. Immediately the route emerges on the west bank to arrive at Dawn Mine, up on the left. 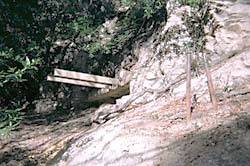 Two steal beams jutting out from the rock wall mark the mine location. To see the tunnel, walk up past the beams to the entrance, which is hidden from view until you peek around the rock. Every responsible trail guide warns against going into the mineshaft because of possible hazards. Exploring the vicinity of Dawn Mine. - The right spur follows the small ridge about 30 yards to an old foundation perched on the ridge. It provides a nice flat place to camp. A few steps more is a rocky outcropping that offers a sunny spot for lunch. - The left route curves and drops back down to meet the main trail about 100 yards downstream from the mine. It's deteriorated in spots with precarious footing. If at the junction you turn left (north, up canyon high on the east bank), in about 30 yards you reach a three-point switchback. - Cutting back sharp right is the trail leading southeast to Dawn Station. You may enjoy walking up this path for 2 or 3 minutes just to see some striking views down the canyon. - From the three-point switchback, take the less-traveled path continuing up canyon (north) (this is the route to Tom Sloan Saddle). Walk up this trail for about 5 minutes and notice a tunnel entrance on the wall of the west bank. Cross the creek and check it out. Retrace your route back to the junction across the creek from Dawn Mine. Note: From the mine, notice a trail heading up canyon (north) on the west bank. This path leads nowhere. It abruptly ends in less than a 100 yards. Perhaps Robinson (pre 9th Edition) adds to the confusion here. In his description of the hike to Tom Sloan Saddle (Hike 21), he writes, (from the Dawn Mine) "Continue up canyon another 1/2 mile..." However, the best way now to continue north is to cross the creek to an unsigned junction, then head up canyon on the main trail (see above). The other option is to ascend the trail southeast to the Mt. Lowe fire road. This is the hike Schad describes (in reverse direction). This adds an extra mile and 600 feet of elevation gain (Schad's number). 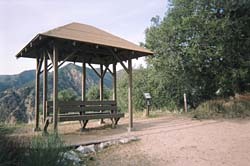 The route offers outstanding views of Millard Canyon and beyond, and it avoids the boulder hopping. It also gives you a better historical sense of the mining operation as you can visualize burros hauling the gold ore up this trial to the Mt. Lowe Railway. Note: Schad's description of arriving to this point after descending the trail is confusing. He writes: "After reaching the gloomy canyon bottom (3.6 miles), the trail goes upstream along the east bank for about 100 yards to the Dawn Mine, perched on the west-side back." But here's the reality: When you arrive near a spur ridge on the east back near the canyon bottom, the mine is directly across the creek from you (hidden from view by the trees). The route that Schad is referring to goes south, curves, and drops down to meet the main trail about 100 yards downstream from the mine (it's deteriorated in spots with precarious footing). But the best route is to veer right (north) and then follow the zigzag trail west right down to the creek, directly across from the mine. To hike this route, from Dawn Mine, cross the creek to the east bank and follow the trail zigzagging briefly up the slope near a small spur ridge that juts westward into the main canyon. You're presented with an option of going left or right. Turn left (north, up canyon) and walk about 30 yards to a three-point switchback. The less-traveled path continuing up canyon, north, is the route to Tom Sloan Saddle. But you cut back sharp right for the trail leading southeast to Dawn Station. The trail is steepa real workout for the legs and lungs. And it's mostly in open sun, so it can be torture on a hot, sunny day. The trail contours in a southeastern direction offering splendid vistas. As Schad rightly observes, "On the way you may encounter a dicey passage or two across perpetually sliding talus." After 0.7 mile, you reach Dawn Station on the Mt. Lowe fire road. This road is the old railway bed for the famed Mt. Lowe Railway, the creation of Professor Thaddeus Lowe. Tourists could experience a thrilling electric trolley ride along the winding route to the Ye Alpine Tavern, tucked in a oak-shaded recess on the southwest flank of Mt. Lowe. Dawn Station is where gold-bearing ore was loaded onto the train, after having been packed by mules from Dawn Mine. 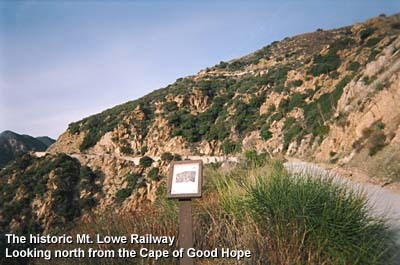 Today, Dawn Station sports a pair of covered benches and serves as the fourth stop on a 10-stop self-guided historic tour of Lowe's popular attraction (See Shad, Area A-5, Trip 10, "Mount Lowe Railway"). Dawn Station - on the old Mt. Lowe Railway bed above Millard Canyon. From Dawn Station, turn right (south) unto the dirt road and follow it down 0.2 mile to the Cape of Good Hope (where the pavement begins). Walk past the clearing on the right, and notice on the left side of the road where the old railway bed trail comes up from Echo Mountain. Enjoy the southeast view of the historic location on the other side of Las Flores Canyon. You can see the Sam Merrill Trail which starts at the top of Lake Avenue and snakes its way up chaparral-covered slopes to Echo Mountain. Continue down the paved road about a 100 yards and turn right unto the signed Sunset Ridge Trail (you can also go down the paved road, but it's a lot less scenic and suffers the full exposure of the sun). The trail zigzags and contours westward through lush chaparral and sections of tree-shaded forest into Millard Canyon. You'll pass old Sierra Camp (Sierra Saddle) at 0.8 miles and in another quarter mile the trail nearly meets the paved road at the place where the road passes through a distinctive box-shaped road cut in the ridge (a spur path to the left leads about 25 yards over to the road as an optional route down). Continue down the trail until it reaches the junction near the canyon bottom. A footbridge and cabin are on the right. Veer left and follow the path back to the road. Turn right onto the road and walk the final 400 yards back to your car. Dan at Dawn - 5-21-01, a gloomy day in May. Standing at the entrance to the tunnel, which is not seen from the creek. You have to peek around these rocks to see the mouth of the mine shaft. 2009 Station Fire - Consumed 160,577 acres and caused considerable damage in Millard Canyon, resulting in five years of closure. The area was reopened in summer 2014. 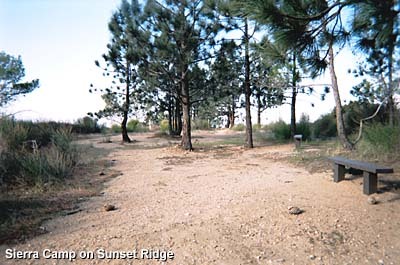 Bike Traffic - The Sunset Ridge Trail is also used by mountain bikers, as is the Mt. Lowe fire road. People Traffic - The fire road and the first mile of the Sunset Ridge Trail to the lower junction appear to be popular with walkers and joggers. One weekday afternoon I encountered a half dozen people in this section of the route and counted 10 cars at the trailhead at 4:30. Echoes at Dawn Mine - By Jake Brouwer. Nice historical treatment of the mine with a lot of interesting details. This article is also reprinted on e-adventure.net. Also see his article on Mine safety. Trails of the Angeles: 100 Hikes in the San Gabriels - by John Robinson (Wilderness Press: Berkley, 6th Edition Jan. 1990, 7th Edition Sept 1998, 8th Edition with Doug Christiansen April 2005). Hike 19: "Millard Canyon to Dawn Mine." Describes an out-and-back, 5 miles round trip with 1,200 feet in elevation gain, taking the route up the canyon. Brief historical background. His trail description is a little vague and inaccurate in a places, as noted in my text above. These problems were finally corrected in the 9th Edition (Wilderness Press: Birmingham, 2013). Afoot and Afield in Los Angeles County - by Jerry Schad (Wilderness Press: Berkley). Area A-5, Trip 8: "Dawn Mine Loop." His loop, 6 miles round trip with 1,600 feet in elevation gain, follows the fire road and Sunset Ridge Trail up to Dawn Station, then descends to the mine, then follows the canyon out. Good trail description, but with some inaccuracy. 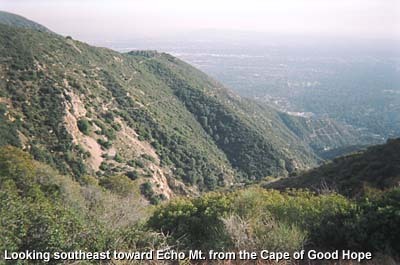 Los Angeles County: A Day Hiker's Guide - by John McKinney (The Trailmaster, 2006). "Millard Canyon, Dawn Mine." Describes an out-and-back, 5 miles round trip with 800 feet in elevation gain, taking the route up the canyon. Brief historical background and good trail description, although scant in details about the mine vicinity. Previously published in Wild L.A.: A Day Hiker's Guide (2003), now out of print. This page was last updated September 23, 2014.